1: What is the FP wheel? 16: What can you do by the FP wheel? 17: What is the FP wheel again? The lid-making was difficult work to be plane of both the lid and the lid receiving part when half drying and to match. The FP wheel overturns the common sense. In the FP wheel throwing tool vertically up and down along a center axis, the distance from a center axis doesn't change at all. In FPwheel, everything decides only by the distance from a center axis. The position of the type board and the mold is adjusted in the lid and the lid receiving part. The nob is fixed into the center axis hole of the lid. Confirm suitable in the state of clay. Under such a condition, all forming ends, and cutting down is quite unnecessary. Production of a lid receiving part. After firing. The state with room a little is the best in the lid because there is a distortion when firing it, too. Remove from the type when you can see the crack by waiting for a while in the lid. In a usual potter's wheel, the lid and the lid receiving were plane while half dried. And after the unglazed pottery, the suitable one was chosen to the set. Remove from the type when you can see the crack by waiting for a while in the lid receiving part. In the FP wheel, the type board moves up and down along a center axis. After forming, it must be suitable if A is suitable for B in the figure below. The lid and the lid receiving part are made beforehand. If the lid receiving part is installed above, it becomes the steady though it made from the hand. Lid and lid receiving part. 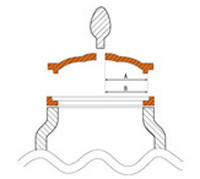 The hole of the central axis becomes the hole that sets the nob.